Walkthrough: After defeating Team Skull in Hau'oli City, you will earn access to Route 2. As you enter Route 2, you can access the Hau'oli Cemetery to the right. A few trainers will be found the first time you go here, and Captain Ilima will be found here later during Captain Mina's Trial. 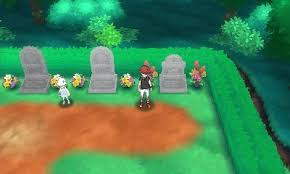 Details: After defeating the Main Story and accepting the Eevee Quest, you can find the Umbreon User in Hau'oli Cemetery.